High-protein powder drink from whey protein for athletes. With natural chocolate flavor. Protein involvement in muscle building, maintenance and recovery is one of the most basic functions for athletes and sportsmen. This does not mean that you need to be a champion to include it in your diet. *Official claims by the European Food Safety Authority (EFSA). Mixture of concentrate, isolate and hydrolyzed whey protein. 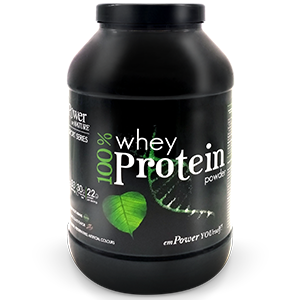 Ingredients: Whey protein concentrate (soy, milk), fat reduced cocoa powder (soy), natural flavor, thickener: guar gum, whey protein isolate (soy, milk), whey protein isolate hydrolyzed (milk), emulsifier: soy lecithin (soy), sweetener: sucralose. For allergens see ingredients highlighted in bold. 1-2 portions per day. Enjoy prior to workouts, after workouts or anytime you desire a high-protein drink. Add 1 scoop (30g) to 200ml of water, milk or a drink of your choice and mix thoroughly. Should be taken in the frames of a balanced diet and a healthy lifestyle. Seal carefully after use. Keep in a cool, dry place (up to 25 οC), out of sight and reach of children. Keep the product away from heat, light or humidity. Do not exceed the recommended daily dose. Food supplements should not be used as a substitute of a balanced diet. This product is not intended to prevent, treat or cure human disease. Consult your doctor if you are pregnant, nursing, taking medication or facing health problems. The notification number of NOM is not a marketing authorization.